A year after the US Secretary of State Colin Powell presented the American case against Iraq to the Security Council, attention is turning from the actual failures of intelligence to why they happened. On 5 February 2003, Mr Powell declared: "Every statement I make today is backed up by sources, solid sources. These are not assertions. What we are giving you are facts and conclusions based on solid intelligence." A year on, that claim is hard to justify in several key respects. Even Colin Powell himself now says that he "doesn't know" if he would have supported war if he had known there were no actual stockpiles of weapons as he claimed that there were in his speech. What is striking is the mindset displayed in the speech. The natural suspicion of Saddam Hussein meant that many pieces of intelligence were interpreted in an unfavourable manner even when another interpretation was available. It is this mindset which some experts now think lay behind the failure of intelligence. Put simply, you see what you want to see. It has happened in warfare many times before. Stalin refused to believe that Hitler would attack in June 1941. The Israelis did not believe the evidence of their eyes before Egypt crossed the Suez Canal in 1973. Britain failed to heed signs that Argentina might take the Falklands in 1982. In the case of Iraq, it was compounded by the knowledge that Saddam Hussein had indeed developed and used such weapons before. Intelligence assessment therefore was based on the assumption that he might well try again. Information which led in that direction was accorded importance. Information which did not was doubted. Dr David Kay, until recently head of the Iraq Survey group, put his finger on one of the central issues when he said that the secrecy and corruption in Iraqi society meant that accurate intelligence from reliable sources was very hard to get. He compared the failure to the overestimates of the Soviet Union's economy in the late 20th century.
" We are particularly bad about understanding societal trends," he told a Senate committee. Another former CIA expert, Kenneth Pollack, in a long analysis of what went wrong in the Atlantic Monthly, also refers to the attitude that Saddam must be up to no good. "Everyone outside Iraq missed the 1995-1996 shift in Saddam's strategy - that is, to scale back his WMD programmes to minimise the odds of further discovery - and assumed that Iraq's earlier behaviour was continuing." Looking back, there are several examples of the mindset at work in the Powell presentation. 1. Material which is simply unaccounted for must be weapons. The UN inspector Dr Hans Blix knew that Iraq had not fully explained what had happened to various quantities of biological and chemical agents, but could never bring himself to say that this was potentially insignificant. It provided a loophole which could be exploited by those who argued that the absence of evidence was not evidence of absence. Mr Powell made use of the loophole. He declared that Saddam Hussein had admitted to having 8,500 litres of anthrax but that he "could have produced 25,000 litres." There was no evidence that he actually did so, but the possibility that he could became the probability that he had. 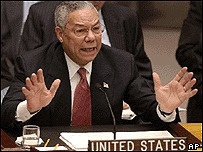 Later, Mr Powell says that "Iraq today has a stockpile of between 100 and 500 tons of chemical weapons agent." This notional agent then becomes something more in the next sentence: "That is enough agent to fill 16,000 battlefield weapons." 2. A reliance on potentially unreliable human sources: the mobile laboratories. Mr Powell relied on human sources in his account of trucks, which, supported by artists' impressions, he described as "mobile, biological agent factories." He quoted four such sources and said that Iraq had at least seven such trucks. Two have been found but crucially there is no agreement as to what they were. The CIA website still says they were for biological warfare. But Dr David Kay told the Senate Committee: "I think the consensus opinion is that when you look at those two trailers, while they had capabilities in many areas, their actual intended use was not for the production of biological weapons." 3. Taking sides over disputed intelligence: the aluminium tubes. This is a prime example of disputed physical intelligence which was presented as reliable on the balance of probabilities. Mr Powell did mention the doubts expressed about whether they were for a uranium-enriching centrifuge or for rocket tubes as some experts concluded. But he came down firmly on the side of the more sinister explanation. The issue is unresolved to this day. What did the photos show? 4. Remote intelligence: interpreting aerial photographs. Much was made of these, which purportedly showed chemical weapons dumps being sanitised of their illegal stocks. Since no such stocks have found, the activity in the photos remains a mystery. They made an impact at the time. But they have not been substantiated by finds on the ground. On the other side of the coin, some of the allegations made by Mr Powell remain strong. The tapes of conversations between Republican Guard officers did refer to the removal of a "modified vehicle" and to the need to hide references to "nerve agents" in wireless instructions. These remain suggestive though not determinative. 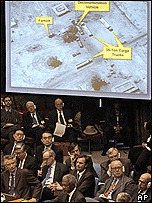 The accusation that Iraq was developing missiles of a range beyond that permitted by the UN has been born out. Also strong was Mr Powell's description of how Iraq failed to come clean and open its books, sites and scientists to full inspection, as it was required to do under resolution 1441. David Kay's conclusion is that Iraq was conducting "weapons of mass destruction-related programme activities." It was a phrase he used in his interim report in October 2003 and one picked up by President Bush. Examples of this, Dr Kay told the Senate Committee, were work on a precursor for VX nerve agent and on the production of anthrax in dry form. His interim report had also referred to a clandestine network of laboratories and to work on ricin and aflatoxin. That is dangerous and illegal activity, but it is some way away from Mr Powell's assertion to the Security Council that "Saddam Hussein and his regime have made no effort, no effort, to disarm, as required by the international community." "Brian Jones says everyone should see this intelligence"